South-eastward from the Cape, off the distant Crozetts, a good cruising ground for Right Whalemen, a sail loomed ahead, the Goney (Albatross) by name. As she slowly drew nigh, from my lofty perch at the fore-mast-head, I had a good view of that sight so remarkable to a tyro in the far ocean fisheries- a whaler at sea, and long absent from home. As if the waves had been fullers, this craft was bleached like the skeleton of a stranded walrus. All down her sides, this spectral appearance was traced with long channels of reddened rust, while all her spars and her rigging were like the thick branches of trees furred over with hoar-frost. Only her lower sails were set. A wild sight it was to see her long-bearded look-outs at those three mast-heads. They seemed clad in the skins of beasts, so torn and bepatched the raiment that had survived nearly four years of cruising. Standing in iron hoops nailed to the mast, they swayed and swung over a fathomless sea; and though, when the ship slowly glided close under our stern, we six men in the air came so nigh to each other that we might almost have leaped from the mast-heads of one ship to those of the other; yet, those forlorn-looking fishermen, mildly eyeing us as they passed, said not one word to our own look-outs, while the quarter-deck hail was being heard from below. "Ship ahoy! Have ye seen the White Whale?" But as the strange captain, leaning over the pallid bulwarks, was in the act of putting his trumpet to his mouth, it somehow fell from his hand into the sea; and the wind now rising amain, he in vain strove to make himself heard without it. Meantime his ship was still increasing the distance between us. 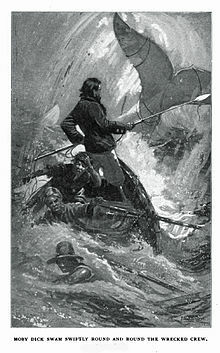 While in various silent ways the seamen of the Pequod were evincing their observance of this ominous incident at the first mere mention of the White Whale's name to another ship, Ahab for a moment paused; it almost seemed as though he would have lowered a boat to board the stranger, had not the threatening wind forbade. But taking advantage of his windward position, he again seized his trumpet, and knowing by her aspect that the stranger vessel was a Nantucketer and shortly bound home, he loudly hailed- "Ahoy there! This is the Pequod, bound round the world! Tell them to address all future letters to the Pacific ocean! and this time three years, if I am not at home, tell them to address them to-"
At that moment the two wakes were fairly crossed, and instantly, then, in accordance with their singular ways, shoals of small harmless fish, that for some days before had been placidly swimming by our side, darted away with what seemed shuddering fins, and ranged themselves fore and aft with the stranger's flanks. Though in the course of his continual voyagings Ahab must often before have noticed a similar sight, yet, to any monomaniac man, the veriest trifles capriciously carry meanings. "Swim away from me, do ye?" murmured Ahab, gazing over into the water. There seemed but little in the words, but the tone conveyed more of deep helpless sadness than the insane old man had ever before evinced. But turning to the steersman, who thus far had been holding the ship in the wind to diminish her headway, he cried out in his old lion voice,- "Up helm! Keep her off round the world!" Were this world an endless plain, and by sailing eastward we could for ever reach new distances, and discover sights more sweet and strange than any Cyclades or Islands of King Solomon, then there were promise in the voyage. But in pursuit of those far mysteries we dream of, or in tormented chase of the demon phantom that, some time or other, swims before all human hearts; while chasing such over this round globe, they either lead us on in barren mazes or midway leave us whelmed.